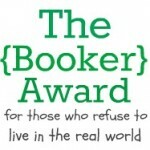 A couple weeks ago, Jansen Schmidt tagged me in a fun and easy meme: the Booker Award. Fun because it’s about books! Easy because it’s about books… hmm, we have to pick favorites. And that’s not so easy. But the “rules” are pretty simple: blog about your five favorite books, link back to the person who nominated you for the “award,” and choose three more people to blog about their favorite books, who will then link back to you. Save My Soul by Zoe Winters. This book showed me how much I love it when romance novels break the rules, and proves that any rule can be broken if it’s done well and for a purpose. One rule in romance is that the hero must never-never-never get busy with any female other than the heroine. Well, the guy in this book is an incubus, and if he doesn’t get it regularly, he’ll go crazy. And kill people, possibly the heroine. Which would break another romance rule – hero and heroine need to be together at the end of the book, which would be pretty tough if one of them’s dead. In Save My Soul, the heroine’s not ready to give it up to a demon, so she goes and finds him a bunch of hookers. Not only does it solve the immediate problem, it’s hilarious, and the prostitutes become endearing secondary characters who provide a good supply of comic relief throughout the book. Because romance is more about the emotions and relationship, Winters pulls this off fantastically. I have her next book and am looking so forward to reading it! Kismet’s Kiss by Cate Rowan is another fantastic rule-breaking romance in that the hero is a sultan of an Arabian-nights-like kingdom in another world. As such, he already has six wives by the time the heroine comes along. This is another great example of rule-breaking done right, and Rowan pulls it off with aplomb, surprising me with how the heroine finally reconciled the sultan’s culture with her own, one-man-one-woman culture. The other thing that struck me about this book was the mix of fantasy and romance–the kind of book I was dying to read all through high school and college, but no one was publishing. I also loved Rowan’s second novel, The Source of Magic, and have her third on my to-be-read list. Threshold by Sarah Douglass. This epic fantasy novel blew me away. It’s not marketed as a fantasy romance, but that’s exactly what it is. Except… for more of that rule-breaking stuff. First, the romance really doesn’t get started until halfway through the book (hmm, sound familiar, Time’s Enemy? :D) and before it does, the heroine’s had another boyfriend. But that isn’t the biggest rule broken. No, in this one, the hero is a noble, and the heroine a slave–common enough in some circles of romance, but in this case, he’s downright abusive, both magically and otherwise. Only later does the reader begin to understand why and how, and what drives him. This book has major, serious conflict, and it’s one where we wonder how the main characters will survive (due to external factors), and if they do, how in the world they’ll ever reconcile the tremendous differences between them. That alone made the book a major keeper for me. Moving to a lighter side (because believe me, after Threshhold I needed it!) is Cattitude by Edie Ramer. This is one of the funniest books I’ve read in years! It’s about a cat who switches bodies with a woman–think Freaky Friday with claws. Seeing how Bella the cat deals with becoming human is a laugh a minute, especially when she starts feeling emotions brought on by her “inferior” human body. Beneath all the laughs is a really sweet subplot involving the lonely, psychic woman who’s now in a cat’s body–and how this gets her everything she wants in the end as well. Finally, I would be remiss if I didn’t include the book I waited years to read: Out of the Ashes by Lori Dillon, which I blogged about earlier this year. Oh, and I’m supposed to “nominate” three people for the award. Jim Winter and Stacy McKitrick have both been blogging about various favorite things recently, but not favorite books. So bring ’em on, you two! And Michele Stegman has had some good bookish posts lately too, so consider yourself nominated as well! Of course, limit it however you like (or not), or if you don’t have the time/inclination to play, no worries! How about you? What awesome books have you read lately? Have you read any of my recent favorites? This entry was posted in Blog, Good Books and tagged author, fantasy, good books, Jennette Marie Powell, reading, romance, writer. Love the pic of you and the car, Jen! I’m really interested in Theshold based on your description. I’ve recently read “Souled” by Diana Murdock–another unconventional love story. Oh all right. You twisted my arm. Thanks, Fabio! I’ve heard about Souled – maybe on your blog? I remember it sounded good! Threshold is absolutely amazing – one of those books you think about long after. Isn’t Cate Rowen awesome! She used to be in my writer’s group and she is about s sweet as they come. I love the sound of Cattitude. just my kind of light whimsy. thanks for the recommendations and congrats on the award. Patricia – Cate Rowan is great! I looooove her books. She’s one of the founders of an email list I’m on, and is a class act all the way. Louise, Cattitude was sooooo funny! If you love cats, you’ll love this book. Sheila, glad you liked it too! Karen – I think the Booker meme is to write about your five favorite books of all time – but I couldn’t narrow it down that much! I don’t think it matters how you do, only that you play! And yes, the TransAm was basically the Pontiac version of the Camaro Z-28 or SS. Thanks for the idea! I’ll try to get some pics of it in its various states of dis-assemby! I haven’t read any of the books you commented on, Jennette, but they sound interesting. I’m gonna have to say, though, your two books Time’s Enemy and Time’s Fugitive are on my favorite list of the most recently read books. Planning to give them to hubby when I can part with my Kindle long enough for him to read them. Catherine, you’ve made my day! Thanks so much!